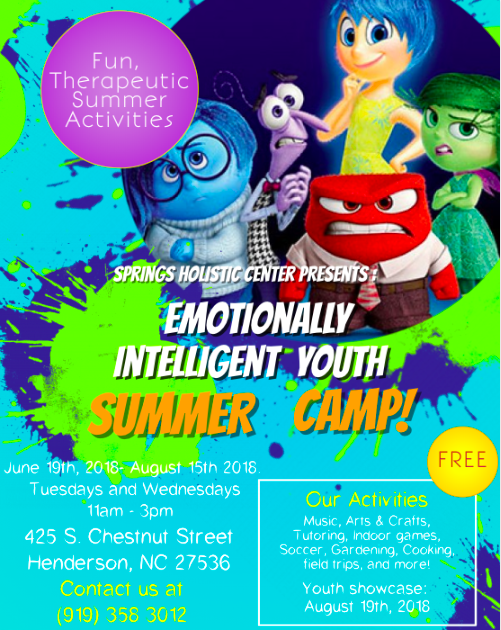 The SPRINGS Youth Emotionally Intelligent Summer Camp 2018, engaged youth in a program designed at caring for their Minds, Body and Soul. Using Cognitive Behavioral Therapy and Dialectical Behavior Therapy's Distress Tolerance Skills (ACCEPTS); the youth focused on Activities, Contribution, Comparisons, Emotions, Pushing Away, Thoughts, and Sensations. Summer camp participants engaged in activities including: Expressive Writing, Dance, Art, Music, Mindfulness, Yoga, Active Living, Gardening, and Field Trips. Special thanks to Jasmine Stammes and The Conservation Fund's Resourceful Communities Program for helping us make the program a success!